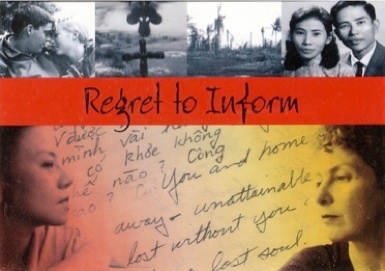 Regret to Inform, a deeply personal, yet universal portrayal of the lasting devastation of war through the eyes of women, Vietnamese and American widows of the Vietnam war. On January 1, 1968, Barbara Sonneborn's husband, Jeff Gurvitz, left to fight in the Vietnam War. Eight weeks later he crawled out of a foxhole during a mortar attack to rescue his radio operator and was killed. Sonneborn learned of her husband's death on her 24th birthday. "We regret to inform you..." read the official notice. The shock and grief eased with the years, but not the anger. On January 1, 1988, twenty years after Jeff's death, Sonneborn woke up suddenly determined to do something about his death in the Vietnam War. She began to write Jeff a heart wrenching letter to tell him the impact that his death had on her life. This on-going letter is the narrative thread of Regret to Inform.